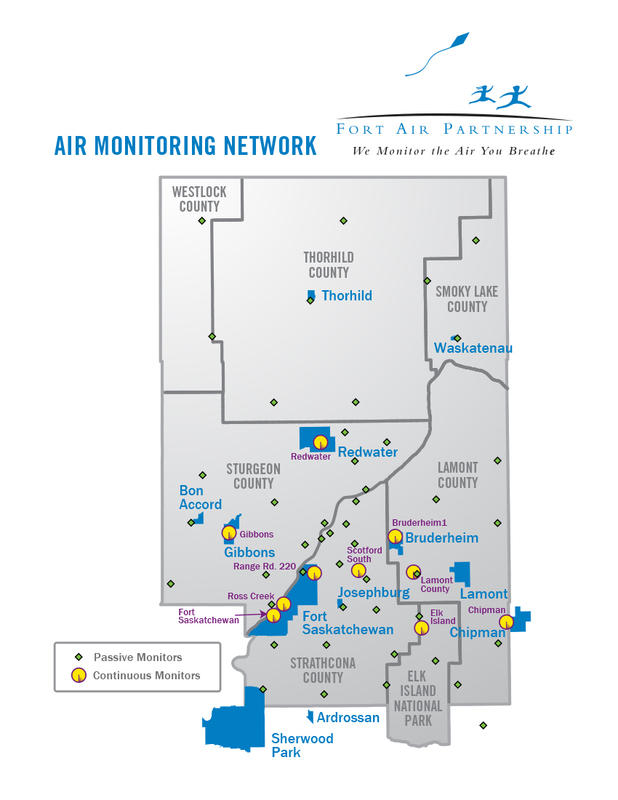 Fort Air Partnership (FAP) is a not-for-profit organization formed in 1997 (read our history) to monitor the air people breathe within a 4,500 square kilometer airshed located immediately north and east of Edmonton. With Alberta’s Industrial Heartland within our borders, we collect and report on air quality data in a region with some of the most condensed industrial development in the province. Our collection and reporting on substances that affect air quality is rigorously controlled, monitored and guided by objectives set by the Government of Alberta. Our work is transparent, governed by a volunteer Board of Directors, guided by an expert, scientific Technical Working Group, and driven by national and provincial standards. Continuous data is collected 24 hours a day, seven days a week and made available to anyone. The Board of Directors is composed of public, industry and government representatives. It follows a consensus decision-making model that enables all parties to have an equal say in decisions. The Technical Working Group directs the management of the air monitoring activities, and provides advice and counsel to the Board on technical matters. The Network Manager, who oversees the day-to-day management and operation of the monitoring network, is the committee’s chair. Like the Board, the Technical Working Group consists of representatives from industry, government and the public. Our Vision: Public, industry and government have a clear understanding of ambient air quality in the region. Our Mission: To operate a regional network to monitor and report credible and comprehensive ambient air quality information.